A single day of events occurring around the world that brings together communities of professional, industrial, educational, citizen, and government groups for our common objective: to ensure that the services and products important to life are easier to access and simpler to use. It is about celebration and education – celebrating the strides we have made in creating usable products and educating the masses about how usability impacts our daily lives. For me, usability and accessibility are personal. The small steps people take that make things like websites, documents and technology products easier to use for people of all levels of ability have a big impact on my day to day life. Without usability and accessibility, it would not have been possible for me to complete my education or do the advocacy work I do today through my blog, my YouTube videos or my presentations. To celebrate World Usability Day, a group of us are releasing a book with the title “I Am More Powerful Than You Think”. The idea behind the book is to show how technology empowers us as people of different levels of ability to pursue our dreams as students, teachers and world citizens. You can watch a YouTube preview which will auto-advance through each page and auto-play the embedded media. This is a great feature recently added to Book Creator. It is a great way to share the work broadly with the popular YouTube service and also a great way to collaborate. I used this feature to share drafts of the project with my collaborators as we went along. To build the book, I used the Book Creator app. Why Book Creator? It is very easy to learn and use (great usability), includes features for making content accessible, and offers the flexibility we needed to tell our story in a way that models Universal Design for Learning (UDL) principles. A text blurb that can be read aloud with word highlighting, using the Speak Selection (text to speech) feature built into iOS devices. I tried to make sure the text was large enough (24px) for anyone with low vision to see. A sound recording of the same blurb. Book Creator makes it very easy to record audio by tapping the Add (+) button, choosing Add Sound and then recording right into the device. As an alternative, you can also add a recording from iTunes, which I did for a few of the sound clips which were emailed to me by the rest of our team. Video: video was really important for this project. Video connects with people in a way that other formats just can’t. It has an emotional impact that is important for working toward change. One tip I learned after contacting the Book Creator team is that you need to make sure to have the right format. If you import the video from the Camera roll as I did, it will be in the QuickTime (.mov) format and this will cause the book to be rejected when you submit it to the iBookstore (it will still work when you preview it in iBooks but if you want to share it widely I recommend uploading it to the iBookstore). It’s a simple fix: with the video selected, open the Inspector and choose Format > M4V. That will ensure your video is in the right format for the iBookstore. Not long after, Christopher Hills released his own More Powerful video and created the hashtag #iAmMorePowerfulThanYouThink on Twitter. I am a visually impaired photographer based in Florida and use my iOS devices for photography and creative expression. Carrie is a special education teacher in Illinois and she uses technology to improve access to education for her students. Christopher is in Australia and he’s a certified Final Cut Pro X video editor with his own video production business. Daniela is in Spain and runs an accessibility consultancy. Sady is a student at Full Sail University in Florida, but she lives in North Dakota and is able to pursue her cinematography degree online. We are diverse in terms of age, gender, geographic location and how we use technology, but we are united by a common mission: to show the world that technology can make a difference in people’s lives when it includes accessibility from the start. For each person, there is also a page that documents our online presence using the hyperlink feature in Book Creator. You can visit our websites, follow us on Twitter, view our YouTube videos and Instagram photos and more. This was important because the many places we post in and participate online are a big part of our stories as well. They build a narrative of what we do and how we do it that is important to understanding the impact of technology in our lives. A nice picture accompanies the contact information and it includes an accessibility description that can be read aloud by VoiceOver to someone who is blind. 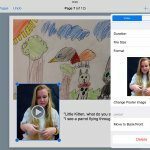 The team at Red Jumper included was great to include this feature in Book Creator to make the books authored with it more accessible to those who use a screen reader. It is important that accessibility be included not just in the app used to create the books (as it is with Book Creator) but in the content that app outputs. With the accessibility descriptions, we can ensure that’s the case. We don’t want this book to be the end of this conversation. If you have a story of how technology makes you or someone you work with more powerful, we would love to hear it. Drop me a line or post a link to your story on Twitter with the hashtag #iAmMorePowerfulThanYouThink so we can find it. The best way to share your story is to use Book Creator to build a few pages according to the template in our book. A nice feature of Book Creator is that you can email a book to another person who can collect several submissions and combine them into one book on one device. This feature makes it very easy to collaborate on global projects like this one. Along with the fact that you can use the app on both iOS and Android, this made it a great choice for us to quickly and easily publish this project. A big thanks to the Book Creator team for continuing to build on the accessibility and usability of this great app.